Crown CopyrightRoyal Navy bomb disposal experts blow up a World War II shell at sea on February 14, 2018. A World War II bomb was discovered near London City Airport’s runway on Sunday. 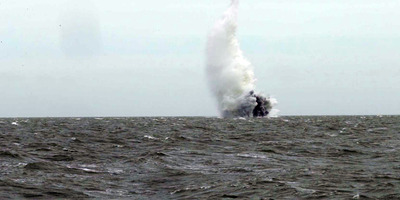 The Royal Navy dragged it out to sea and blew it up on Wednesday. Watch a video of bomb disposal experts detonating the device. An unexploded World War II bomb that forced a London airport to close was detonated at sea by the Royal Navy on Wednesday. 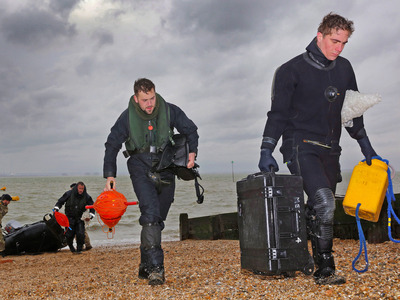 The 500-kilogram, 1.5-metre-long tapered-end shell was blown up with high-grade military detonators off the coast of Essex, where the bomb was transported earlier this week. The explosion took place around midday. The navy released video footage of its bomb disposal experts blowing up the device with high-grade military detonators. The device was first discovered buried in dense silt on Sunday near London City Airport’s runway, located by the River Thames. The airport closed Sunday night and all of Monday so Royal Navy bomb disposal experts could remove the device. 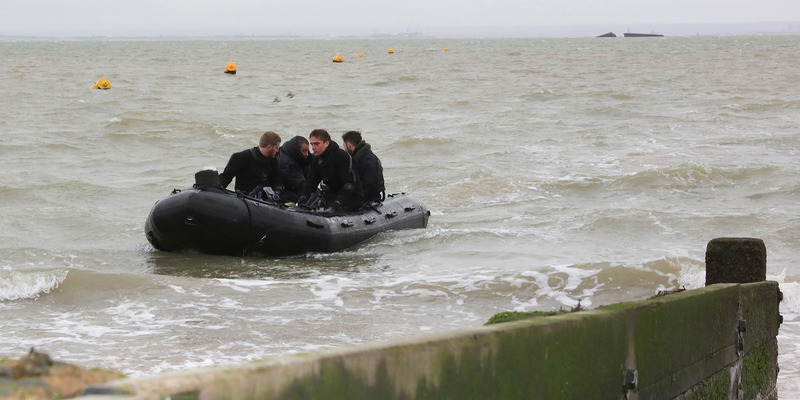 Crown CopyrightA Royal Navy bomb disposal team return to the shore after destroying the bomb. Crown CopyrightRoyal Navy bomb disposal experts return after detonating the device. Divers removed the ordnance with a lifting bag on Monday, dragged it down the Thames overnight and took it to Shoeburyness, a coastal town 60 kilometres east of the bomb’s original location. The area where London City Airport stands used to be an industrial center, and it came under heavy bombardment from German planes during the war. Unexploded bombs still occasionally turn up during construction work.